Elizabeth Campbell Karlsgodt has received funding from the U.S. National Endowment for the Humanities. Helen Mirren’s latest film, Woman in Gold, tells a true story of an arts battle. Mirren stars as Maria Altmann, a naturalized US citizen who sues the Austrian government to recover a glittering, golden portrait of her aunt, Adele Bloch-Bauer, painted by Viennese art nouveau master Gustav Klimt and looted from her family’s home by the Nazis. In museums across the US there are paintings, sculptures and other works of art with provenance gaps from the Nazi era, signaling a need for ongoing research into rightful ownership. The Austrian government believed the painting had been willed to them in 1925 by its subject, Adele Bloch-Bauer. For this reason, they argued the painting had nothing to do with restitution – the return of works to the victims of Nazi theft or their heirs. However, in 1998 Austrian journalist Hubertus Czernin unearthed documents in Austrian archives indicating that Adele’s husband Ferdinand had been the rightful owner when the Nazis seized the collection in 1938. Ferdinand had died nearly penniless in Zurich in 1945, leaving all his assets to his niece Maria Altmann, along with her brother and sister. Czernin’s findings boosted Altmann’s claims to the portrait and four other Klimt paintings still held by the Austrian government. Ultimately, Altmann – a naturalized US citizen – decided to file her claim in a US court by invoking the Foreign Sovereignty Immunities Act. The law provides exceptions to sovereign immunity when a country violates international law with US commercial interests at stake. The case went all the way to the Supreme Court, which ruled in Altmann’s favor in 2004. Rather than face a protracted legal battle, Austria offered to try the case via an arbitration panel of Austrian experts. The panel awarded the painting to Altmann. Altmann would eventually sell the portrait to cosmetics heir and World Jewish Congress leader Ronald Lauder for a then-record sum of $135 million. 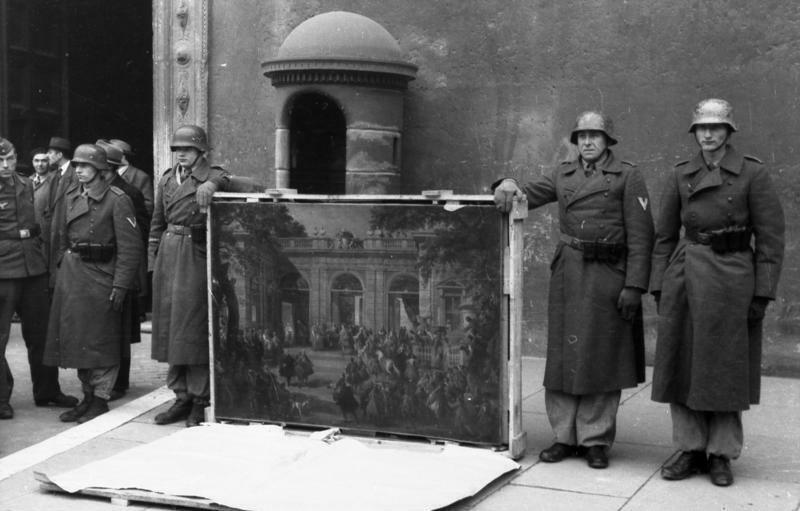 Altmann’s ultimate victory allowed Americans to relish the US role in the restitution of Nazi-looted art. In this way, Woman in Gold continues a heroic art recovery narrative also reflected in The Monuments Men, the 2014 George Clooney film that extols the bravery of American men who risked their lives to recover thousands of works from Nazi repositories in castles, churches and salt mines. But Woman in Gold glosses over the broader historical context of art restitution. In fact, after decades of thwarting restitution claims, the Austrian government – like other European countries – had already been actively taking steps to compensate victims of Nazi persecution. In 1996, it auctioned looted artworks still held by the government, giving $14.6 million in proceeds to Jewish organizations. Two years later, Austria was among 44 countries that signed the Washington Conference Principles on Nazi-Confiscated Art, a non-binding agreement to pursue just and fair solutions in restitution cases. And the same year, an Austrian Federal Art Restitution Law provided for restitution of works held by state museums that had been donated under duress or looted in the Nazi era. Art enthusiasts in America should ask themselves whether more could be done to ensure US museums are not holding Nazi-looted art. After World War II, some American museums expanded their collections by purchasing art or accepting donations without researching the objects’ ownership history in the Nazi era. In Manhattan not far from the Neue Galerie, where the Adele Bloch-Bauer portrait now hangs, the Museum of Modern Art (MoMA) holds one of the greatest modern art collections in the world. But according to historian Jonathan Petropoulos, author of The Faustian Bargain: The Art World in Nazi Germany, the museum’s founding director, Alfred Barr, acquired pieces confiscated or stolen by the Third Reich. And MoMa recently defended its ownership of three paintings by German artist George Grosz purchased by MoMA in 1952 from Curt Valentin, a New York dealer who had funneled art from Nazi Germany to the US. In 2009 heirs of the artist had filed a restitution lawsuit in US District Court, which found the statute of limitations invalidated the heirs’ claim, a decision confirmed on appeal in 2010. MoMA won a legal victory but the ethical implications are less clear. Uncertainty remains about the origin of other works in the collection. The MoMA Provenance Research Project provides a list of 800 works under investigation. But ownership gaps abound. In each case, there’s no indication of ongoing research. Meanwhile in Pasadena, California, the Norton Simon museum is currently embroiled in a lawsuit over two Cranach paintings claimed by Marei von Saher, heir of the Jewish Dutch dealer Jacques Goudstikker, whose collection was seized by Nazi leader Hermann Göring. The Norton Simon website does have a general statement on the importance of provenance research and “filling gaps” in Nazi-era ownership. But it provides no list of relevant works in the collection. And while most US art museums agree to abide by ethical standards in acquisitions and provenance research established by the American Alliance of Museums, there’s no government-mandated enforcement mechanism. So here we are today: 17 years after the US hosted the Washington conference on Nazi-confiscated art and pledged to facilitate “just and fair” solutions, a lack of transparency in American museums remains. Yes, the “Woman in Gold” was returned to its proper owner. But how many Nazi-era portraits, landscapes and still-lifes painted in countless colors remain in America’s museums – havens that are not their rightful homes?